Maybe they should have just sprung for the exterminator. It would have been a whole heck of a lot cheaper. A popular restaurant in China just lost millions over a dead rat found in a patron's soup. 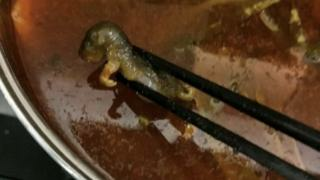 The pregnant woman pulled the boiled rodent out of her hot pot at Xiabu Xiabu and shared the photo on social media. Her husband spoke to a local news outlet and said that when the family confronted the restaurant staff, they offered 5,000 yuan ($729USD) as compensation. To make matters worse, the husband claims one staffer suggested his wife get an abortion if she was worried about the baby's health, offering 20,000 yuan for the procedure. The stock price for Shandong province restaurant dropped $190 million in market value but is slowly starting to recover.